On a warm day in June, an unvaccinated 9-year-old girl is sent to your ED. Earlier that day, she was seen at her primary care physician’s office by a physician assistant who reported that the child had headache and fever intermittently for 3 to 4 days. The PA was concerned that she might have meningitis. The patient arrives, ambulatory and alert, complaining of a bitemporal headache. Her fever at home was 38.3°C (101°F). There has been no photophobia or rash, and there are no ill contacts. The child took acetaminophen 2 hours prior to arrival. On physical examination, the child is tired but not toxic-appearing. She had an episode of vomiting in triage. Her vital signs are: temperature, 38.7°C (101.6°F); heart rate, 142 beats/min; respiratory rate, 22 breaths/min; blood pressure, 119/77 mm Hg; and oxygen saturation, 95% on room air. Her pain score is 8/10. Her physical examination is notable for head and neck discomfort when moving from sitting to the supine position. Her neck has full range of motion and she is negative for Kernig sign and Brudzinski sign. The remainder of her examination is normal. The patient is given a 20 mL/kg normal saline bolus IV, 6 mg ondansetron IV, and 10 mg/kg ibuprofen orally. An hour later, her vital signs are: temperature, 37.2°C (99°F); heart rate, 126 beats/min; respiratory rate, 20 breaths/min; and blood pressure 111/67 mm Hg. Her pain score is now 4/10. Her peripheral white blood cell count is 16,000 with a left shift, and her chemistry is notable only for a glucose level of 146 mg/dL. Given the girl’s lack of frank meningismus and improvement with ibuprofen, is a lumbar puncture indicated? What are the most common causes of meningitis in this age group? Should antibiotics be given? A 4-month-old boy presents with a history of cough, pallor, fever to 38.9°C (102°F), and decreased feeding on the morning of presentation. The infant drank 6 ounces about 4 hours before arrival, but would not feed at presentation. The boy’s parents state he did not vomit or have diarrhea. His past medical history is notable for cesarean delivery at 36 weeks' gestation. There was prolonged rupture of membranes and he was hospitalized for 3 days after delivery. The boy’s parents report no prior illnesses, and his immunizations are up-to-date. On physical examination, the boy’s vital signs are: temperature, 38.9°C (99.6°F); heart rate, 158 beats/min; respiratory rate, 50 breaths/min; and oxygen saturation, 98% on room air. The boy is arousable but sleepy and does not fix and follow. His fontanel is flat. His HEENT examination is notable for nasal congestion with mucus secretions. The boy’s cardiopulmonary and abdominal examinations are unremarkable. The boy’s capillary refill is < 2 seconds, but his muscle tone is decreased. He is fussy during the examination. Is this merely an upper respiratory infection or should meningitis be considered? What are common clinical features of meningitis in this age group? What further management is indicated? Which empiric antibiotics—if any—are indicated at this time? 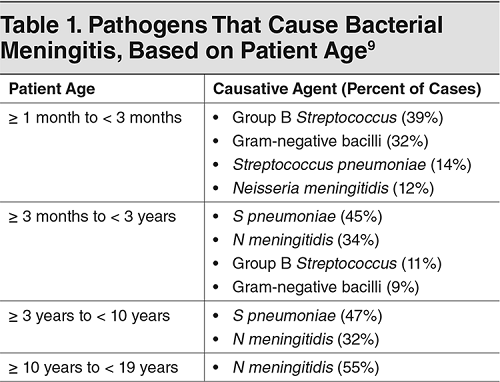 Bacterial meningitis in children is one of the most high-risk diagnostic and management challenges for the emergency clinician. Widespread implementation of vaccination strategies against pneumococcal, meningococcal, and Haemophilus influenzae type b diseases has led to a dramatic decline in the frequency of this condition over the past 3 decades.1,2 In some ways, however, this has made the early identification of bacterial meningitis more difficult for the emergency clinician. The rare occurrence of the condition means that a high-volume pediatric emergency clinician may evaluate only 1 child with bacterial meningitis every 3 to 5 years. Since bacterial meningitis can present with many signs and symptoms, differentiation of bacterial meningitis from viral meningitis and from other mimics can be difficult. If the presentation is not “classic” in nature, diagnostic and therapeutic delay can occur, frequently with devastating consequences. Inflammatory markers in the serum and cerebrospinal fluid, such as procalcitonin, may help distinguish between bacterial meningitis and viral meningitis. Children with suspected bacterial meningitis should be treated early and aggressively. Adjunct therapies such as corticosteroids are still highly debated but may be indicated in select cases. Until better diagnostic tools and therapies are established, emergency clinicians must remain vigilant to avoid treatment delays for a child with bacterial meningitis. This issue of Pediatric Emergency Medicine Practice reviews the classic clinical findings associated with bacterial meningitis, offers guidance for using studies and scoring systems to aid in the diagnosis of bacterial meningitis, and provides evidence-based recommendations for the management of patients with bacterial meningitis. A literature search was performed in PubMed and the Cochrane Database of Systematic Reviews using the search terms: pediatric bacterial meningitis, viral meningitis, pediatric lumbar puncture, neonatal fever, antibiotics for pediatric meningitis, and pediatric meningitis diagnostic studies. A total of 98 articles published between 1992 and 2018 were reviewed. The literature regarding bacterial meningitis management and therapy contains multiple multicenter trials and systematic reviews presenting strong evidence. More-recent articles, including several prospective cohort studies, have evaluated novel markers of bacterial meningitis. Although the overall incidence of pediatric bacterial meningitis in the United States has decreased, the prevalence of non–PCV-13 pneumococcal serotypes and late-onset (6-90 days) and very-late-onset (> 90 days) group B Streptococcus meningitis has increased. While the presence of the most widely recognized signs of bacterial meningitis—fever, bulging fontanel, meningismus, altered mental status, headache, and vomiting—significantly increases the likelihood of bacterial meningitis, a number of cases have been published in which these signs were absent. Typically, patients with bacterial meningitis have an elevated CSF protein and a decreased CSF glucose-to-blood glucose ratio < 0.60. The sensitivity of neck findings ranges from 45% to 95%. The sensitivity of assessing the range of motion in the sagittal plane may be enhanced by performing the test with the child sitting on the bed with legs outstretched rather than with the legs over the edge of the bed. 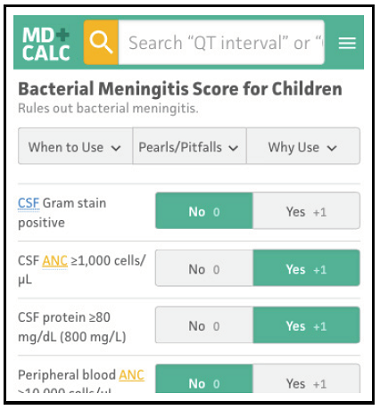 The bacterial meningitis score for children rules out bacterial meningitis in pediatric patients with suspected meningitis. The bacterial meningitis score (BMS) predicts bacterial versus aseptic etiology of meningitis in patients aged 29 days to 19 years with suspected meningitis. The BMS can help determine if the patient will require admission for parenteral antibiotics while awaiting cerebrospinal fluid (CSF) culture results. A higher BMS indicates a higher likelihood of bacterial meningitis. Although the score was derived and validated in a population of children aged 29 days to 19 years, the sensitivity, specificity, and negative predictive value (NPV) of the BMS decrease significantly for children aged < 2 months. Therefore, the creators of the BMS advise against using it for children who are aged < 2 months, as well as for children who have already received antibiotics prior to the lumbar puncture, are ill-appearing, or have examination findings that are indicative of an invasive bacterial infection (eg, petechiae and purpura). The BMS is not effective at ruling out potentially harmful nervous system infections (eg, herpes encephalitis, Lyme meningitis, tuberculous meningitis) that would require antibiotics. Meningococcal meningitis can present without CSF pleocytosis; thus, patients with meningococcal meningitis could be misclassified as not having inclusion criteria for use of the BMS. It is important to perform a thorough physical examination to assess for petechiae or purpura if there is suspicion for meningococcemia or meningococcal meningitis, as the CSF culture may have a false normal result in these cases. The incidence of bacterial meningitis has dramatically declined since the advent of highly effective vaccines against some of the more common causes (eg, Haemophilus influenzae type b, Streptococcus pneumoniae). This has made it more challenging to determine which patients should be admitted for observation while awaiting CSF culture results. The BMS helps identify patients who do not necessarily require observation due to the higher likelihood that they have aseptic (ie, spontaneously resolving) meningitis. It also helps avoid the financial burden and health risk that are associated with hospitalization for observation and administration of parenteral antibiotics. The BMS can be used in pediatric patients aged 29 days to 19 years with suspected meningitis. Consider discharging the patient with close follow-up (ideally within 24-48 hours) and return precautions explained to the caregiver, including new seizure activity, altered mental status, purpuric rash, or other concerning symptoms. Patients may have received a dose of empiric antibiotics after a lumbar puncture was performed if there is concern for bacterial meningitis. If no antibiotics were administered, consider giving a single dose of a long-acting antibiotic with good CSF penetration (eg, ceftriaxone) prior to discharge. Consider admitting the patient for observation and administration of parenteral antibiotics while awaiting CSF culture results. Make sure the CSF is sent for culture. Consider continuous monitoring of the patient’s vital signs, along with performing regular neurologic examinations. Start administration of empiric broad-spectrum antibiotics if these were not previously administered. Consider expanding the antimicrobial coverage. If there is concern for herpes encephalitis, add acyclovir. If there is high clinical suspicion for tuberculous meningitis, consult with an infectious disease specialist and consider rifampin, isoniazid, pyrazinamide, and a fluoroquinolone or aminoglycoside. Consider steroid administration based on the patient’s clinical presentation, the geographic area, and any potential risk factors. Abbreviations: BMS, bacterial meningitis score; CSF, cerebrospinal fluid. The clinician’s gestalt and the patient’s severity of illness and clinical presentation supersede the application of the BMS. If there is significant suspicion for bacterial meningitis, clinicians should err on the side of caution and admit the patient for observation and empiric antibiotics. The BMS should be used in patients aged 29 days to 19 years who have a CSF white blood cell count of ≥ 10 cells/μL. Do not use the BMS if the patient is critically ill, has recently received antibiotics, has a ventriculoperitoneal shunt or has recently had neurosurgery, is immunosuppressed, or has another bacterial infection that requires antibiotics (including Lyme disease). The original BMS was derived from a multicenter retrospective cohort study published by Nigrovic et al in 2007. Data were collected from 20 participating emergency departments at academic medical centers over a 3-year period. The study used the BMS to classify 3295 patients aged 29 days to 19 years who had CSF pleocytosis. Among the 1714 patients who were categorized as very low risk, 2 were found to have bacterial meningitis. Both of the miscategorized patients were aged < 2 months and had E coli meningitis with an E coli urinary tract infection but a negative urinalysis. The sensitivity of the BMS for bacterial meningitis was 98.3% (95% confidence interval [CI], 94.2%-99.8%) and the NPV was 99.9% (95% CI, 99.6%-100%). The investigators attempted to refine the score using recursive partitioning, which led to a simpler model with only 3 variables, but also led to 1 additional patient with meningitis being misclassified as very low risk. Given that the 2 misclassified patients were aged < 2 months, the investigators analyzed the BMS for a subgroup of all patients aged < 2 months and found that the sensitivity was 92.3% (95% CI, 74.9%-99.4%) and the NPV was 99.5% (95% CI, 98.3%-99.9%). The BMS was validated by Nigrovic et al in 2012, in a meta-analysis of studies published between 2002 and 2012 that included 4896 patients aged 29 days to 19 years. The sensitivity for bacterial meningitis was 99.3% (95% CI, 98.7%-99.7%) and the NPV was 98.3% (95% CI, 96.6%-99.3%). In 2013, Kulik et al published a systematic review of several bacterial meningitis predictive rules. Among the studies reviewed, the authors found that the BMS had the highest quality of evidence and the best performance to date, but they still recommended that the score be further evaluated with prospective trials. Diagnose and manage patients with bacterial meningitis. Specialty CME: Included as part of the 4 credits, this CME activity is eligible for 4 Infectious Disease CME and 2 Pharmacology CME credits, subject to your state and institutional approval. Faculty Disclosures: It is the policy of EB Medicine to ensure objectivity, balance, independence, transparency, and scientific rigor in all CME-sponsored educational activities. All faculty participating in the planning or implementation of a sponsored activity are expected to disclose to the audience any relevant financial relationships and to assist in resolving any conflict of interest that may arise from the relationship. Presenters must also make a meaningful disclosure to the audience of their discussions of unlabeled or unapproved drugs or devices. In compliance with all ACCME Essentials, Standards, and Guidelines, all faculty for this CME activity were asked to complete a full disclosure statement. ​The information received is as follows: Dr. Posadas, Dr. Fisher, Dr. Nigrovic, Dr. Mishler, Dr. Skrainka, Dr. Claudius, Dr. Horeczko, and their related parties report no significant financial interest or other relationship with the manufacturer(s) of any commercial product(s) discussed in this educational presentation. Dr. Kaplan made the following disclosure: Pfizer grant. Dr. Jagoda made the following disclosures: Consultant, Daiichi Sankyo Inc; Consultant, Pfizer Inc; Consultant, Banyan Biomarkers Inc; Consulting fees, EB Medicine.